With flagships coming in like clockwork, Samsung obviously thought it was time for their entry-level Android lineup to also get a fresh of coat of paint. And that goes all the way to the bottom, where the Galaxy Y prepares to make room for the new kid on the block. This time around, with the new naming Samsung is not leaving anyone guessing about who this phone is for. 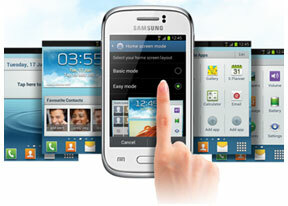 The Galaxy Young S6310 is the most basic of packages in Samsung's updated Android lineup. It's the most affordable too, so that says it all about the level of equipment. Let's just say, you could probably fit the hardware specs of this one on a matchbox. The important thing though is that the Young does well to upgrade its predecessor in terms of screen resolution and processing power. Quite surprisingly, the Young even has more RAM than the supposedly higher-ranked Galaxy Fame, which we only recently reviewed. Not that it makes that much difference but, based on our experience with the Fame, the Young should be quite nippy and responsive. The only place where the Galaxy Young clearly feels inferior is still imaging - it's got a really low-end 3MP fixed focus camera. It has no front-mounted camera either. Oh well, everything that's built to a budget involves compromise and the Galaxy Young is no different. What it will be trying to do is convince enough users that its flaws are outweighed by its charms - like offering Android Jelly Bean on rock bottom pricing. With Jelly Bean in the driver's seat and a solid connectivity set, complete with things like hotspot and Wi-Fi direct, the Galaxy Young is trying to stay relevant, albeit on a shoestring. The FM radio and the microSD card slot will certainly be appreciated too. Inevitably, there were some corners cut, but we're yet to see if that's had a significant impact on the overall experience. not good, when i try open youtube links at facebook the pages won't open..
it's nice..only bad thing is when phonememory is full one has to transfer the downloaded files to the sdmemorycard by hand..there's no automatic switch for that like in other galaxy models..